The Penguins 12-game winning streak came to an end on Tuesday. It marked the second-longest winning streak in franchise history. But it was five games short of the team’s longest winning streak, 17 games in 1993, which set the NHL record for most consecutive wins. That record still stands today, and it doesn’t look like it will be beaten any time soon. 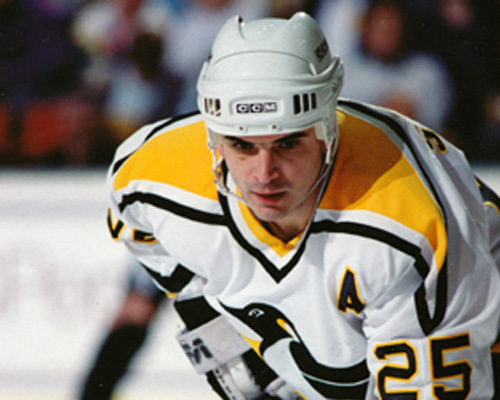 The 1992-93 season was a turbulent, yet extremely successful, one for the Penguins. Pittsburgh captured its first and only President’s Trophy with 119 points in the standings after posting a 56-21-7 record. On Jan. 12, 1993, Mario Lemieux announced that he had been diagnosed with Hodgkin’s Disease and he missed 24 games to undergo radiation treatment. On March 2, the day of his last treatment, he flew to Philadelphia to play against the Flyers, where he scored a goal and an assist and received a standing ovation from the Philadelphia fans in a 5-4 loss. The Penguins struggled through Lemieux’s absence, and found themselves trailing Montreal for the top spot in the NHL by four points. Buffalo’s Pat LaFontaine passed up Lemieux in the NHL scoring race, and he led the Penguins captain by 12 points as of March 9. But that was when everything changed. 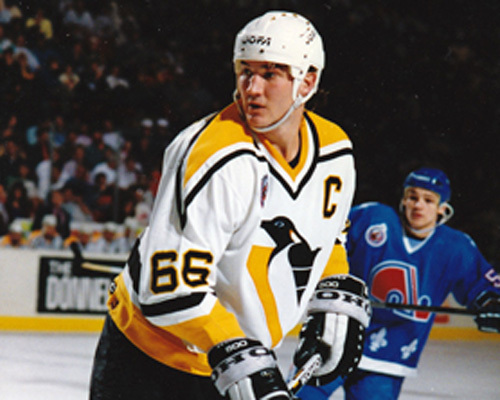 The game against the Bruins was the first game Lemieux played in Pittsburgh since being diagnosed with cancer. He tallied an assist to kick off his epic comeback in the scoring race against LaFontaine. But he still trailed him by 12 points. Nobody at the time really knew what the win kick-started. Joe Mullen notched two goals, including the game-winner. The team didn’t know at the time that the game marked the beginning of the team’s historical run. But the main story was Lemieux’s return to Pittsburgh. The second game of the Penguins’ recent 12-game winning streak was an overtime win (5-4 shootout win over Carolina on Nov. 19). But that’s not the only connection the 2010 streak has with the 1993 squad’s stretch. The 1993 team’s record streak may not have happened if not for current assistant coach Tony Granato, who played for the Kings at the time. With the game in overtime, and a possible tie looming, Granato slashed Ulf Samuelsson and was sent to the box. On the power play, Jaromir Jagr scored the game-winner. 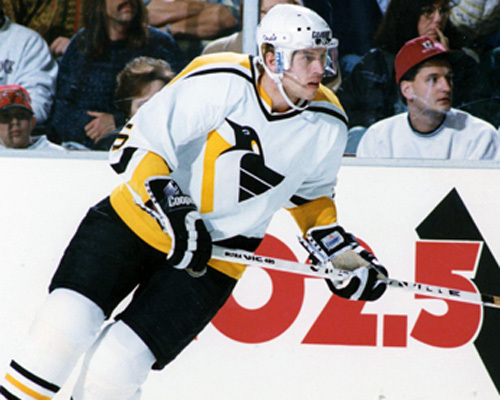 Wayne Gretzky tallied a goal and an assist, while Lemieux bested him with a goal and three assists. On March 12-13, the Great Blizzard of 1993 dumped a whopping 25 inches of snow on the Steel City. For some perspective, the Feb. 5, 2010 snowstorm last winter piled 21 inches on the city. The March 13 game on Long Island had to be postponed to the next day. And another game, against Ottawa, was pushed back to later in the month. The 42nd victory of the season set the franchise record for most wins and points (90). Little did fans know that the Penguins would add 29 more points on top of that. “That’s certainly my plan, to try to catch LaFontaine,” Lemieux told the Post-Gazette’s Dave Molinari. “It’s going to be a good race." Lemieux lit the lamp four times for the second game in a row, and he also tallied an assist to decrease LaFontaine’s lead to eight. The win was the Penguins’ 26th on home ice, which set a new franchise record. Much like the Penguins 7-2 win at Columbus on Dec. 4, Pittsburgh fans invaded Ohio in 1993 to provide a considerable “home-ice advantage” for the Penguins. It was supposed to be a neutral-site game in Richfield, Ohio between the Penguins and Oilers, but Molinari estimated that Penguins fans made up about 99.8 percent of the 18,782 in attendance at Richfield Coliseum, which is located between Cleveland and Akron. The NHL’s Cleveland Barons played there from 1976-79. Stevens notched his 50th goal of the season with a power-play tally, which tied Lemieux as the only player in franchise history to record back-to-back 50-goal seasons. The Oilers’ Bill McDougall thought he scored the game-tying goal in the final minutes, but referee Paul Stewart determined that he whistled the play dead. Stevens sealed the deal 27 seconds later with an empty-netter. The win pushed the Penguins ahead of Montreal by four points for the top spot in the NHL. And Lemieux’s five points (2G-3A) brought him within five points of LaFontaine in the scoring race. Stevens was impressed with the simple fact that Lemieux was even challenging LaFontaine. “He’s missed so many games, and to be in a position he’s in right now…he deserves to win that scoring title.” Stevens told Molinari. Lemieux tallied one goal and three assists in the victory, giving him 21 points in five games to further close in on LaFontaine. With the win, the Penguins clinched a playoff spot. It was the first eight-game winning streak in franchise history and the team topped the 100 point mark in the standings for the first time ever. Lemieux added another three points to give him 136 points on the season, one shy of LaFontaine’s 137. But the star of the game was goaltender Tom Barrasso. The Penguins had a bit of a defensive lapse and forced Barrasso to make 36 saves, many of them being quality scoring chances. With the two points in the standings, the Penguins clinched the Patrick Division Championship, but nobody really cared. “We had it under control for the last month or whatever,” Stevens told Molinari. The team was primarily concerned with winning the President’s Trophy and another Stanley Cup. Lemieux’s goal and two assists pushed him a point ahead of LaFontaine, completing his seemingly-impossible comeback. In a game that was rescheduled due to the Great Blizzard, the story wasn’t about the Penguins’ streak. Ottawa was on a much more eye-popping streak. Ottawa lost on the road for the 37th time in a row, tying the NHL record for traveling futility. The win was the Penguins 50th of the season, and Lemieux tallied a goal and an assist. The Penguins absolutely dominated the Whalers, and the Islanders’ record came into view. Lemieux pitched in with two goals and an assist, and with his 144 points re-took the lead away from LaFontaine, who had 142 points. For the first time in franchise history, the Penguins won the President’s Trophy for clinching the best record in the NHL. The Penguins fell behind 2-0 after the first period, but three goals in the second gave them a lead they wouldn’t relinquish. Now that they achieved their goal of being the top team in the NHL, the Penguins set their sights on another prize, the record for most consecutive wins. The Penguins faced a challenge, playing without the talents of Stevens and Samuelsson, but they prevailed nonetheless. Lemieux assisted on two goals and clinched the game with an empty-netter. The Penguins were one game away from tying the nhl record, which made the next game at Montreal – the eventual Stanley Cup Champions – even more important. The game was a nail-biter, as the Penguins and the Canadiens traded tallies throughout regulation. In overtime, though, the hero wasn’t Lemieux, Jagr or Stevens. It was Samuelsson – he of two previous goals – who scored the game winner to tie the 1982 Islanders’ record of 15 consecutive wins. He took a pass from Larry Murphy and ripped the puck past Patrick Roy (who would go on to win the Conn Smythe Trophy). "Sometimes you need a little help from somebody like that, somebody who's not expected to score," forward Dave Tippett told Molinari. "Ulfie charged up the ice and made a good shot." The crowd of 16,164 went crazy and the players celebrated like it was a playoff game. With the chance to etch their names in the record books, the Penguins came out flying and absolutely dominated the Rangers. Lemieux lit up the Rangers’ defense on his way to tallying five goals on just eight shots. The Penguins took sole possession of the record for most wins in a row by an NHL team. Goalie Barrasso made a couple great passes to set up two breakaway goals for Lemieux, whose scoring outburst all but shored up his fourth Art Ross Trophy. The Penguins already set the record for most consecutive wins. They already clinched a playoff berth, the Patrick Division title and the President’s Trophy. So they really had very little to play for in the penultimate game of the regular season. But the Penguins bested the Rangers for the second day in a row to finish off the record at 17-straight wins. The streak would end in the regular-season finale, a 6-6 tie at New Jersey. Lemieux finished off the 17 games with 27 goals and 23 assists for a whopping 60 points. He finished the year at the top of the NHL with 160 points (69G-91A), despite playing only 60 games. Le-Magnifique started off the winning streak 12 points behind LaFontaine, but he would finish the season 12 points ahead of him, and not even cancer could stop him.